Sometimes nonprofits have notice that legislation about their issues is coming up for a vote or a hearing on the congressional floor. Other times, they don’t—and it is time to scramble to respond. 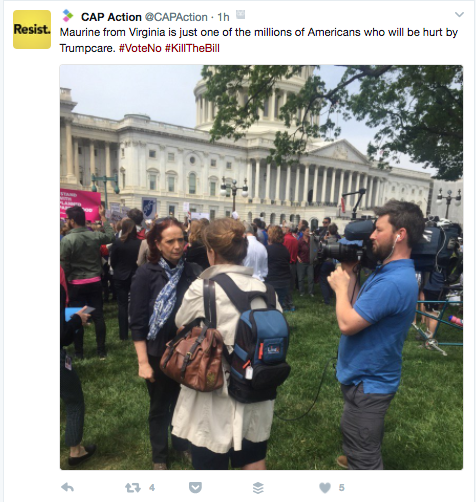 The Center for American Progress Action Fund (CAP Action) provided a master class in social media rapid response this week when Congressional Republicans announced that the latest attempt to pass healthcare legislation would hit the floor for a vote—the night before the vote. But regardless of how much notice organizations have before a vote (or any other big event) CAP Action offered an effective roadmap of how to respond. Note that while ReThink Media doesn’t work on healthcare issues specifically, CAP Action’s response is such a valuable case study for our member organizations of how to respond when our issues are ready for the hopper that we couldn’t miss the opportunity to share. First, CAP Action confirmed that a vote was scheduled to take place. Importantly, this post also shared a quick and dirty whip list of members of Congress on the fence—the targets of this rapid response efforts. 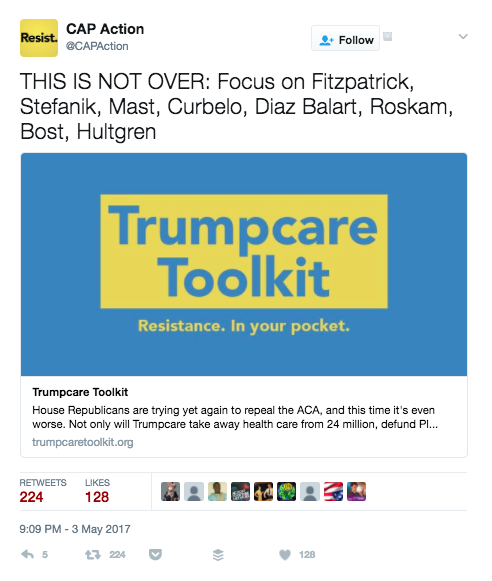 The post also included a toolkit for activists to use as they contact the lawmakers. 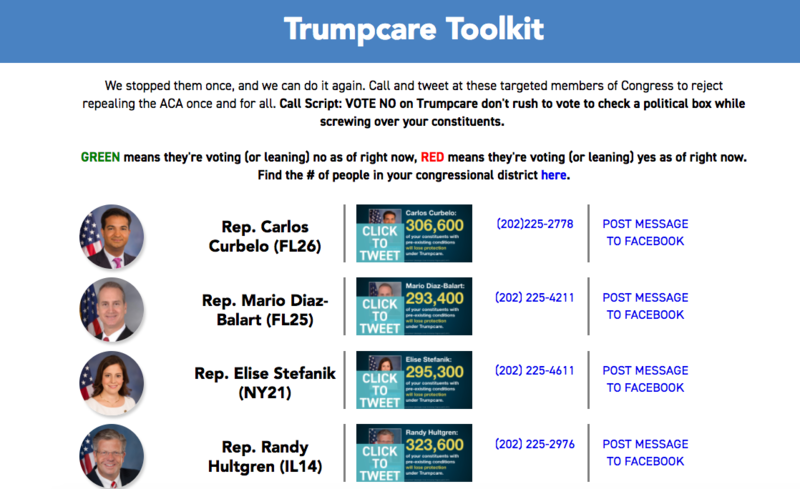 The toolkit again contained the whip list; the phone numbers of their congressional offices; a script for those calls; and social media graphics tailored for each member about how many constituents would lose their healthcare protection under Trumpcare. Bonus: These graphics were easy to share with “click to tweet” and “post to Facebook” hyperlinks at the ready. 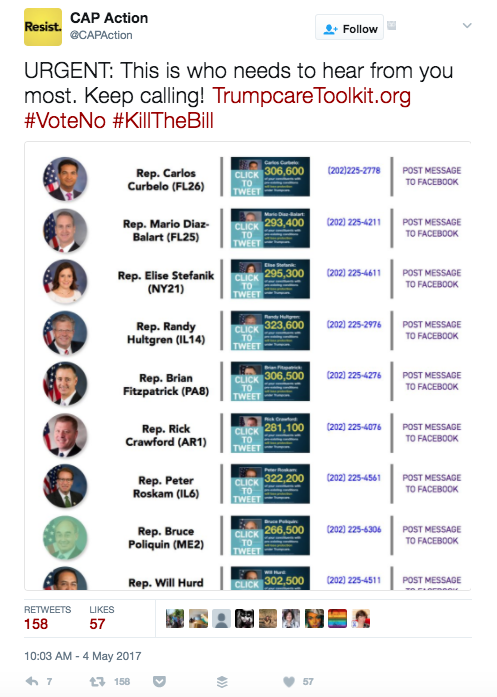 CAP Action designed state-specific social media graphics about how constituents could contact their members of Congress on the whip list. 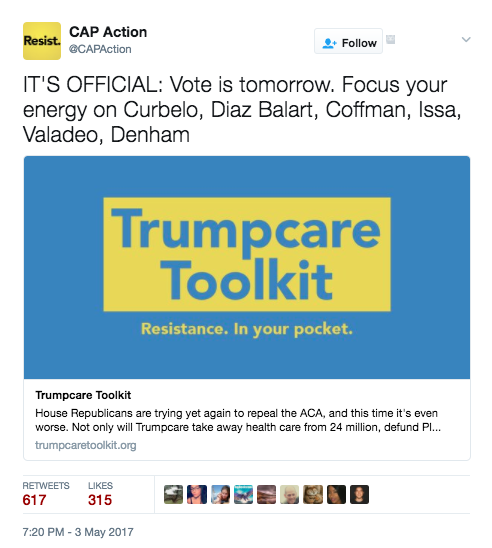 On the one hand, CAP Action could have also included the members’ Twitter handles to encourage constituents to reach the lawmakers online, as well. On the other hand, congressional staffers have indicated that phone calls from constituents are more likely to sway their bosses than social media or form letters. 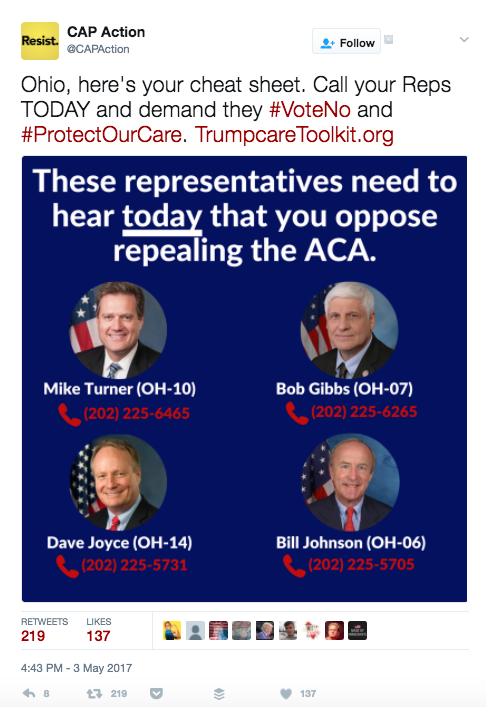 Our conclusion: CAP Action probably did the right thing by keeping this graphic focused to the phone numbers. It’s cleaner visually, and it’s a much clearer call to action. 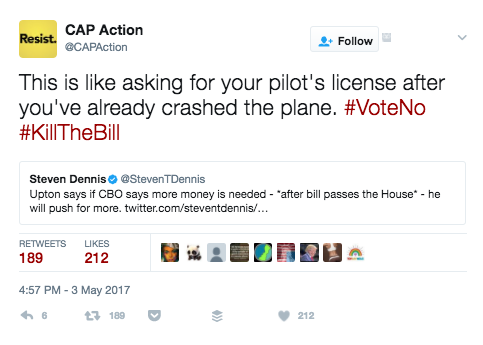 The constituents have no questions about what CAP Action wants them to do. Some people on social media were talking about the bill one way. CAP Action responded with its differing perspective. For the record, ReThink is always a fan of using metaphors as a conduit to explain an issue. CAP Action continued to update their members with the latest from the floor and the organization’s strategy. They included an updated whip list and again linked to their online toolkit. 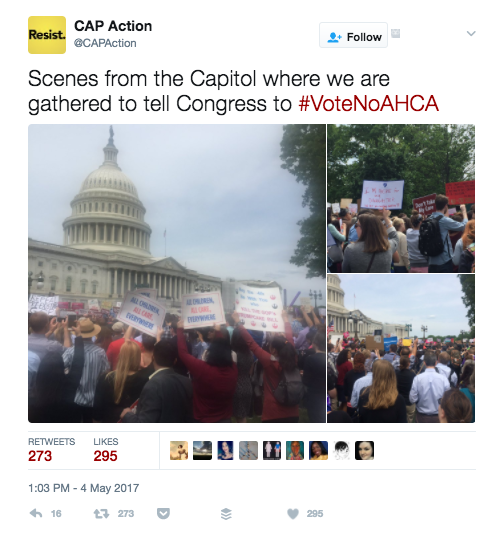 CAP Action instilled a sense of urgency in their members to call their lawmakers—and to do it NOW. 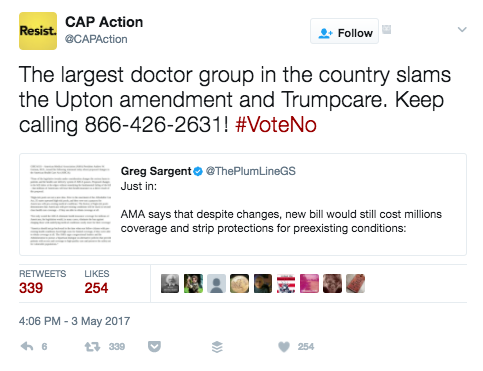 CAP Action also responded to breaking news and referenced the validators who agree with them that the bill must fail. 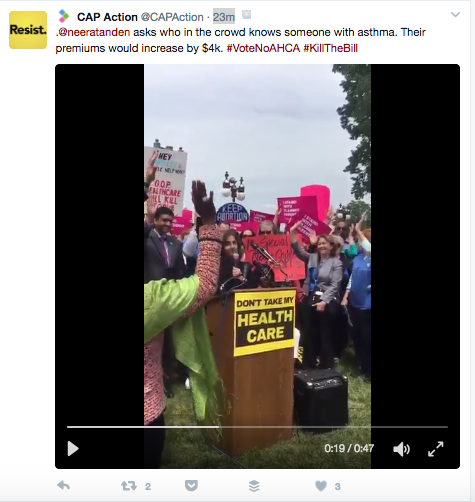 CAP Action mobilized their members to come protest outside of the Capitol Building and shared photos and videos online for those supporters not there in person. It also helps to keep the momentum going on the congressional calls. 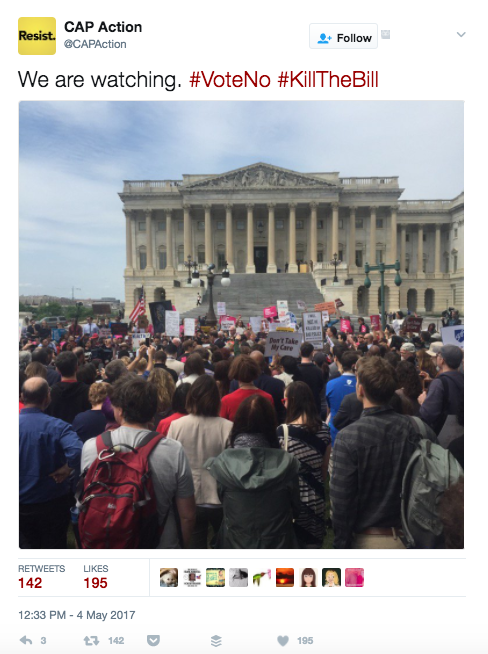 It shows how large the crowd opposed to the bill is. Social psychology teaches us that people want to be on the winning team. Especially those who are on the fence. Showing the people power in the streets will help to change some minds. An in-person event, especially one with that kind of turnout and fervor, is perfect for news coverage. Expect many reporters – for print, online, and broadcast outlets – to be there capturing the scene and interviewing protesters. Update: Confirmed. Media on the scene. An aside: We also love that some of the signs at the protest are branded, professional, printed signs and that some are homemade and much more personalized. The protest feels authentic, and there is no questioning why protesters are there. The people power! The public pressure! The action! Swoon! 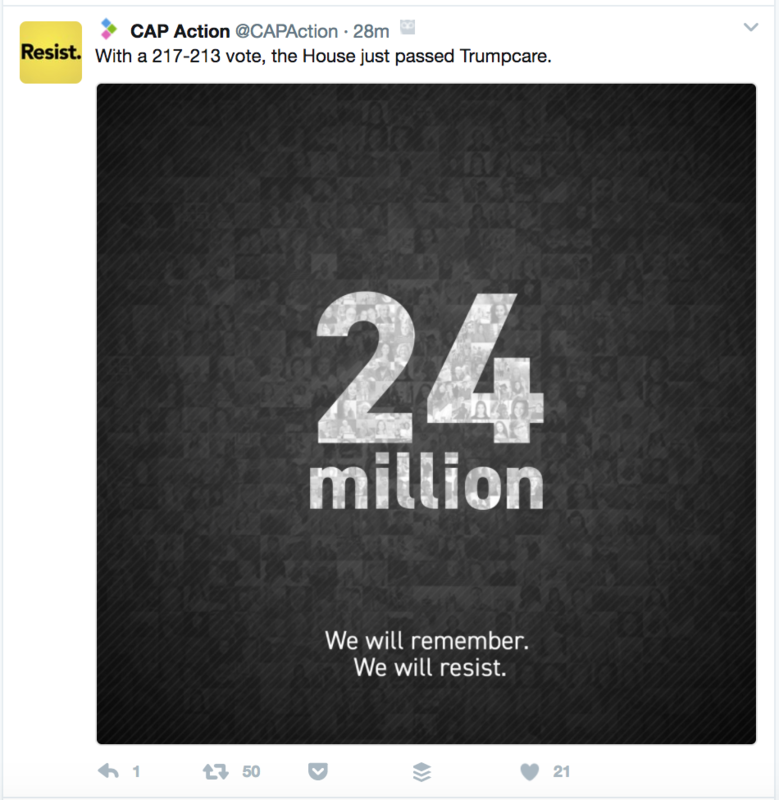 After the vote, CAP Action immediately updated its followers about how the healthcare vote played out. This is something your organization needs to do, regardless of whether the legislation passed or failed. Keeping members apprised of progress, especially in such a tense rapid-response moment, is critical for ensuring that supporters will continue to spring into action for the next fight. What are the most rapid-response efforts you’ve seen? Tweet to us @rethink_media and let us know!